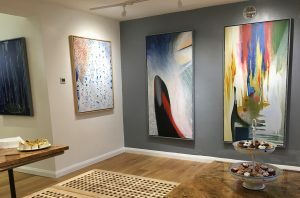 Over fifty people attended the opening of the retrospective exhibition of paintings and prints by Molly van der Wei on Saturday for a first glimpse of work spanning over twenty-five years. 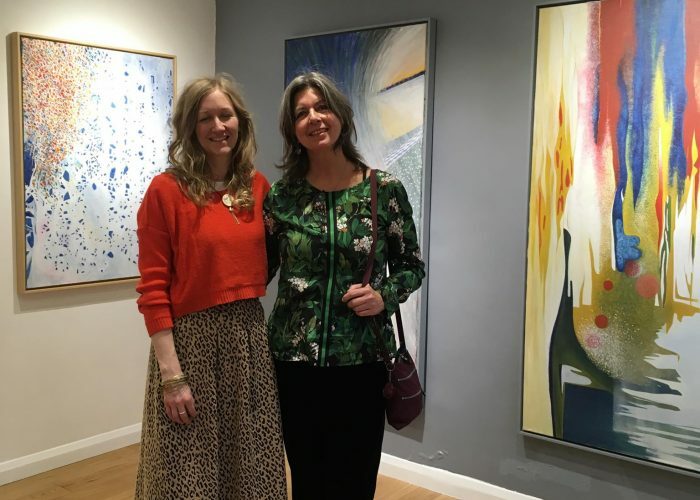 The private view was a diverse mix of people, from artists, musicians and writers to bankers, architects and local business owners who discussed the artwork and the inspiration behind each piece. 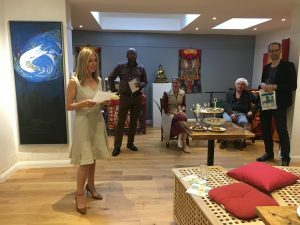 The exhibition was opened with a speech by Liz Thomas, one of the coordinators of Dechen London, who welcomed Molly van der Weij and the guest of honour, Khaywang Lama Jampa Thaye, founder and spiritual director of Dechen, a organisation of international Sakya and Karma Kagyu centres and Molly’s Buddhist teacher. Lama Jampa expressed his admiration for Molly’s great skill and dedication in producing works of such beauty and encouraged people to take the work displayed into their hearts. ‘The truth is beautiful and magical. It is there when all things fall into place spontaneously and you see its presence, a whole greater than the sum of its parts’. The private view was also attended by Emily Maguire who will be performing in the same space on 6 December. The singer-songwriter with five albums to her name has recently published a book of poems entitled Meditation Mind and it’s an event not to be missed.